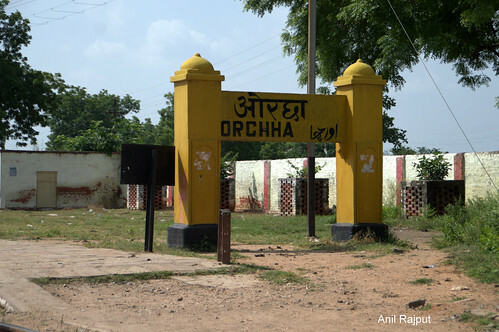 Orcha a small sleepy town on the banks of river Betwa but it was once the capital of the mighty Bundelkhand State of Madhya Pradesh . Founded by the King Rudra Pratap Singh, a Rajput ruler of Bundelkhand , was the first king of Orcha and built the Fort in 1501 AD , a warrior tribe, whose ancestors one young Rajput prince sacrificed his life for a Goddess, Vrindavasini, in return, the Goddess blessed that he and all his descendants would come to be known as the ‘Bundelas’, meaning, ‘those who gave blood’ the Orchha Bundelas came to be known as the chief of the Bundela clan. 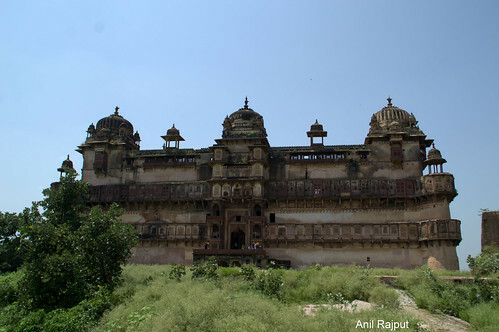 The succeeding rulers, the most notable was Raja Bir Singh Ju Deo who built the exquisite Jehangir Mahal, in the 17th century, to celebrate the visit of Emperor Jehangir to Orcha, a tiered palace crowned by graceful Chhatris. 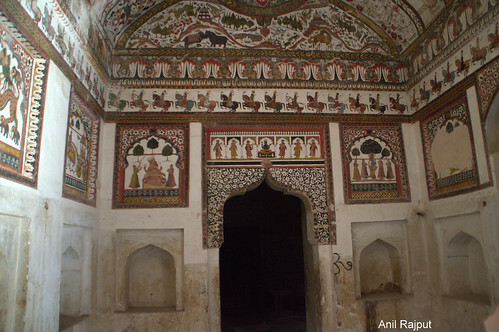 The whole Mahal is decorated beautifully with different geometric patterns and paintings of peacocks and flowers which represent the finest flowering of the Bundela school of painting. From here the view of soaring temple spires and cenotaphs is spectacular. the mother of Jahangir was also a Rajput, Jodha. 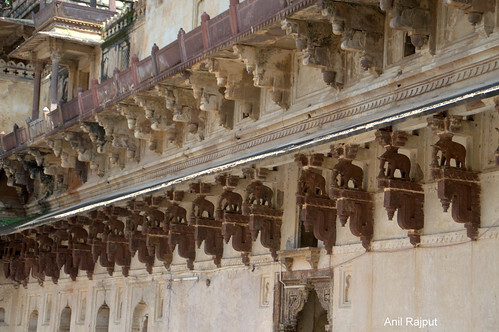 It is with this in mind that the Rajput king of Orcha had built the Jahangir Mahal. The Durbar-e-Khas, or the Durbar Hall, is situated on the first floor of the palace and is surrounded by high battlement walls. It is well fortified, and right above it are a number of musket holes through which the enemy was shot at. The Diwan-i-Am is an assembly hall where the king often held meetings with his council of ministers. Rani Mahal is famous for its lovely paintings and unique architecture. 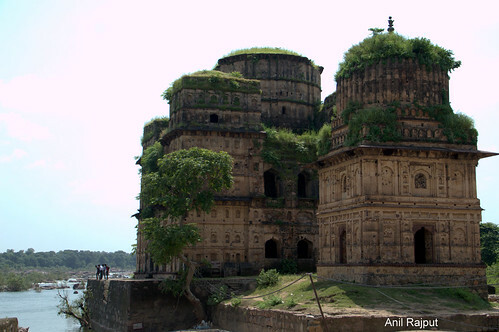 Rani Mahal, was the royal residence of the Queen of Raja Madhukar Shah. A great devotee of Lord Ram, the queen decorated her bedroom with murals featuring scenes from the epics. The exquisite paintings of Bhim and a bird flying with elephants are really fantastic. The Rai Praveen Palace was constructed by Prince Indrajit Singh for his beloved of three stories. 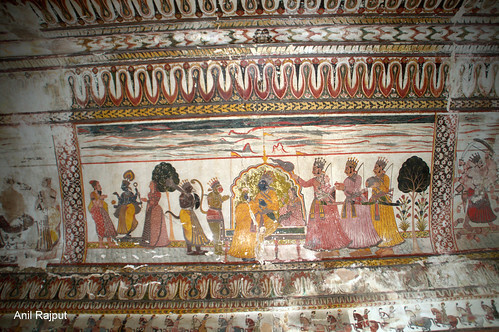 The walls of the central hall on the second story bear many paintings depicting the several moods of the Rai Praveen. The palace is combined with a garden divided into two parts wall and which is popularly known as Anand Mahal Bag (Garden). The Rai Praveen was a great beauty whose main accomplishments were dancing, horse riding and poetry. The famous poet Keshavdas has compiled Kavi priya to honor Rai Praveen and praised her beauty. 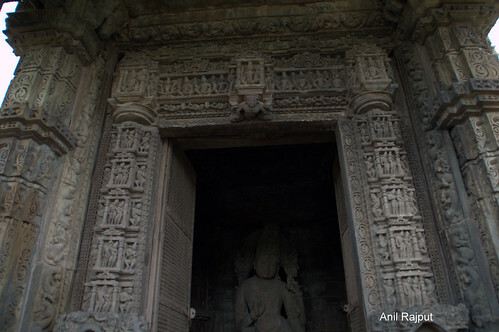 In the Laxminarayan Temple and Raj Mahal, vibrant murals encompassing a variety of religious and secular themes, bring the walls and ceilings to rich life. 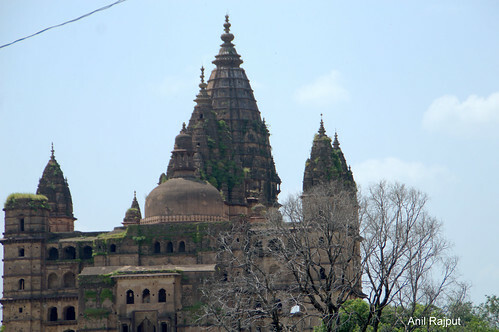 Long tapering structures of temples and places act as the major landmark of this small town . Raja Rudra Pratap started the work on Raja Mahal but after his death in 1531, his son Bharath Chand did the main portion of the palace but it was completed Raja Madhukar Shah , one of the finest examples of Mughal architecture. It has the typical “jali” or lattice work at the entrance , a square shaped palace, divided into two beautiful courtyards. The outer courtyard has some beautiful arches, while the inner ones have some of the most beautiful paintings. Ram Raja Temple , it is the only place in India where the Lord Ram is worshiped as a King in a Palace receives the Guard of Honor every day , Raja Ram is seated in a Padama Asan with the left leg crossed on to right thigh , has a sword in his right hand and a shield in the other , Mata Sita is on the left brother Laxman on the right , Maharaj Sugreev , Narsingh Bhagwan and Durga Maa are also present in the darbar on the right side , Hanumaan ji and Jamwant ji are praying just below Mata Sita. 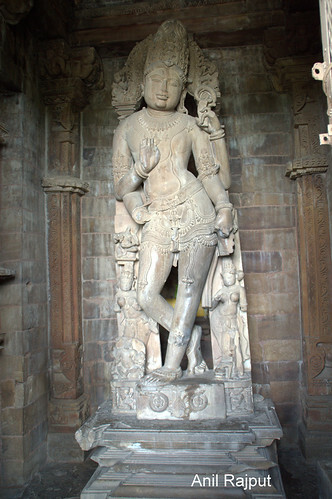 Originally the Chaturbhuj temple was built to place the Idols of Lord Ram but when Idol was brought from Ayudhya it was kept at the Queens Palace the Ranibas or the Rani Mahal to be installed at Chaturbhuj Temple which is right next to the palace but next day it could not be removed and since then Lord Ram is being worshiped as Raja Ram at the palace . 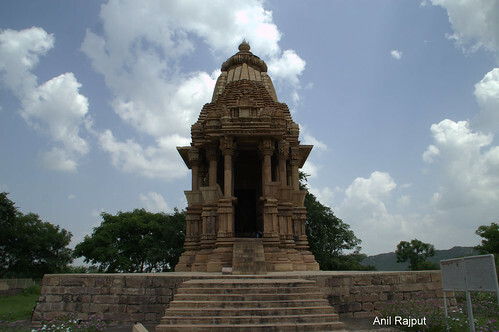 There are fourteen Chatries or memorials constructed as a mark of respect for the imperial blue blood of the mighty rulers of Bundelkhand dynasty. The royal tombs of Maharajas, Chhatris are placed on a elevated platform three floors buildings are open on all sides, have domes or pinnacles.